It possesses energy related to the heart chakra. The energy that the rose quartz crystal gives can also be used to treat certain heart conditions and problems with blood circulation. It is believed to help prevent thrombosis and heart attacks, as well as make the heart muscles stronger. 8 x 5 mm Oval Sri Lankan Moonstone. Velvet Pouch. With Spares. Strong Flexible Corded. “this sparkly heart is just to say have a very Happy Birthday” A beautiful silver heart with sparkling crystal centre is the perfect gift for the Birthday girl. 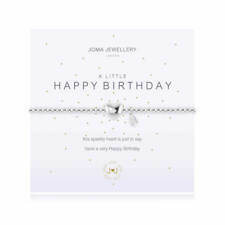 Beautifully presented on a simple white Joma Jewellery card, and delivered in a gorgeous white gift bag with silk bow. It is a crucial first aid stone for calming emotional shock and panic, and provides grounded support during the process of dealing with painful issues. Rhodonite has a strong resonance with forgiveness and giving the soul the love it needs in order to heal. Rose Quartz and Moonstone bracelet believed to aid fertility and love, topped off with a sweet little worker bee charm which represents and stands for "family". Moonstone is believed to enhance relaxation and emotional balance, give protection during pregnancy and childbirth and represents love. This beautiful Amazonite is a super-calming stone and many people use it to relieve stress of all kinds. It also enables one to see a problem from anothers point of view in order to affect peace or to see both sides of an issue objectively to resolve ones own inner conflicts. Handmade chain bracelet from 8 mm Moonstone beads. Moonstone is a stone that you should have if you wish to harness and increase your personal power. It will boost your self-esteem and improve your sense of self-worth. JOMA JEWELLERY. Joma Jewellery is handmade, nickel free and plated in sterling silver. Silver Plated Beaded Bracelet. 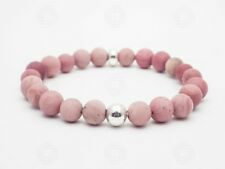 Pretty pink and silver tone quartz beads on round bracelet. Rose Quartz, the semi-precious stone of Taurus enhances emotional healing and self-love. TAURUS, THE BULL - 20TH APRIL TO 20TH MAY. Style:cuff bangle. hope you could understand. 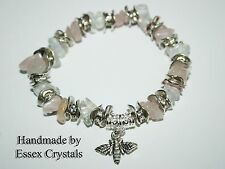 The bracelet is made with 6 and 8 mm Rose Quartz gemstones and. crystal stones. 6mm silver plated rhinestone rondel shaped beads with. (Cubic Zirconia Diamond Bracelet. This is a beautiful example of a Cubic Zirconia bracelet. AAA Grade Cubic Zirconia. This Bracelet includes a Free black Jewellery gift bag :). Bracelet Size:8cm adjustable up to 25cm. Each bracelet is elasticated to fit most size wrists. Coral symbolizes life and blood force energy. Dark red coral is used for heating and stimulating the bloodstream. It is used as an aid to depression, lethargy or deficient nutrition. Et Spiritu Jewellery. The bracelet is adjustable in size and can be worn loose on the wrist or further up the arm. Handmade in Jaipur, India. Each bracelet is elasticated to fit most size wrists. Agate is stone everyone should have for protection.It is one of the oldest stones in recorded history. Agates attract strength. Agate is a protection from bad dreams. Cubic Zirconia Diamond Bracelet. This is a beautiful example of a Cubic Silver plated Zirconia bracelet. AAA Grade Cubic Zirconia. This Bracelet includes a Free black Jewellery gift bag. Bracelet Information. Fun bracelet made with 15mm multi-coloured lightweight fimo clay patterned hearts, separated by 4mm dyed howlite stone beads. Silver-plated lobster clasp (other types of clasp are available upon request). 10mm Sri Lankan Moonstone. Velvet Pouch. Flexible Corded Bracelet. I can even make bespoke jewellery with your chosen stone, length of chain or width of bracelet. She is a certified Reiki Master/Teacher in both traditional Usui and Angelic Reiki, as well as an Advanced Crystal Healer. Since childhood, Kim always had an affinity with crystals, but it wasn’t until adulthood during a continued cycle of ill health that she experienced her first Reiki session. Healing Balancing Reiki Energy Jewellery. Small Chakra Chip CRYSTAL Gemstone BRACELET. Hematite- Base Chakra. GEMSTONE GEMCHIP. Green Quartz( Aventurine ) Heart. Clear Quartz- Crown. BRACELET is unique. 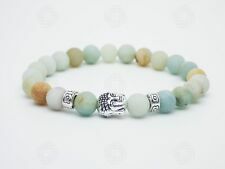 Bracelet with natural dyed agate stones and a Tibetan silver heart charm. Finished with a lobster clasp and a Tibetan silver cross charm on the extender chain. Lead and nickel free. This would make an excellent gift. Bracelet is approx. Material: Natural stone, silver-plated, alloy. See our full range of jewellery HERE. Simply roll on and roll off. Rose quartz is a stone of the heart. A healing gemstone, it carries an energy of compassion and peace, tenderness and healing. 100% Natural Chakra Stones Used to Make this Bracelet. Natural Gemstone Bracelet. Silver Plated Chain. Feel free to ask anything about our product and service. Need Help! BLACK TOURMALINE Gemstone. WIRED BEADED CHIP BRACELET. Protective Stone. As your bracelet will be unique to you. it is vital you cleanse and purify the stone. Artisans of India have made each one. EVERY ONE IS DIFFERENT. Bracelet with natural fewshwater pearls. 6mm silver plated rhinestone rondel shaped beads with. the bracelet is made with 7-8 mm fewshwater pearls and. the beads are threaded onto an elasticated cord. Bracelet with natural Howlite beads, dyed. the bracelet is made with 8 mm dyed Howlite beads and. Because of its porous texture howlite can be easily dyed with different colours. Howlite appearance is white with fine grey or black veins in an erratic often web-like pattern and is opaque with a sub-vitreous lustre. An elasticated bracelet with natural freshwater pearls, aqua blue howlite beads and they are separated by rhinestone spacer roundels. The bracelet is elasticated and is 19cms long without any expansion. It is 10mm wide. FREE UK P&P. The bracelet is made with 6 mm Tiger's eye gemstones and. 6mm silver plated rhinestone rondel shaped beads with. 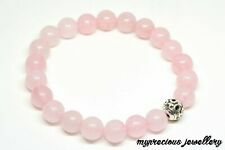 Rose Quartz, Encased Love Heart Charm & Hematite Bead Bracelet - Stunning!! Rose Quartz Encased Love Heart & Hematite Beaded Bracelet Perfect Gift! !